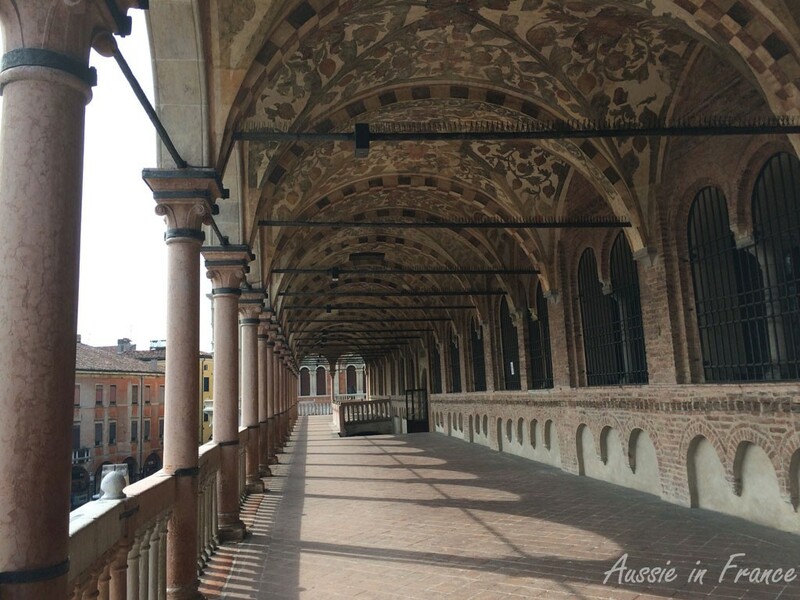 I’ve been wanting to visit Padua for a very long time. Many years ago, we toured northern Italy and got as far as Vicenza. We can’t remember why we didn’t go any further. 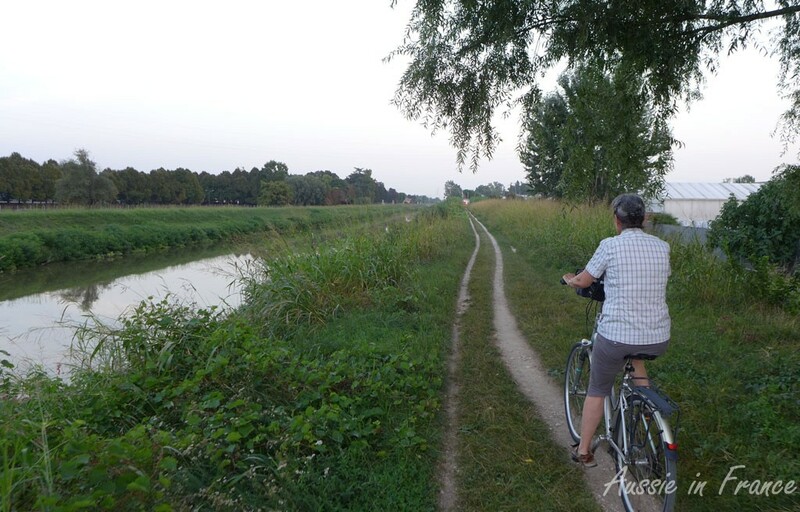 Our Routard guidebook tells us that the best way to visit Padua is by bike. Jean Michel is a little dubious, especially after Lake Garda which is not really geared towards cyclists, even though we made the most of the bike paths that do exist, particularly on the eastern side. We’ve reserved a B&B seven kilometers from the centre and I’m hoping we’ll be able to cycle into the old town. The Routard also says that if we buy a Padova (Padua) Pass, we can park for free in the Rabin car park just outside the historical centre. The only catch is that you have to park first, then buy the pass at the tourist office. A close-up of some of the 78 statues of famous men, philophers, writers, men of science and doctors. It turns out that you enter your registration number in the ticket machine, then insert one euro. You pay the balance when you come back to get the car. We set off and are very impressed by the number of people on bikes. Most of the roads have a bike path on one side, though it is usually only separated from the road by a yellow line. It doesn’t seem to pose a problem. We get to the pedestrian only area and see that everyone is wheeling their bike. I ask at the tourist office, which is just nearby, and the lady explains it only concerns the immediate vicinity (Piazza Cavour). Elsewhere, you can cycle wherever you want. You just have to watch the pedestrians. Which we do. Our pass costs 16 euro for 2 days and also includes free public transport and free entrance to several monuments, the most important of which is the Scrovegni Chapel which already costs 13 euro so it’s worth it. The lady then reserves our entrance to the Chapel at 2.30 pm next day which seems to me a very civilised way of doing things. 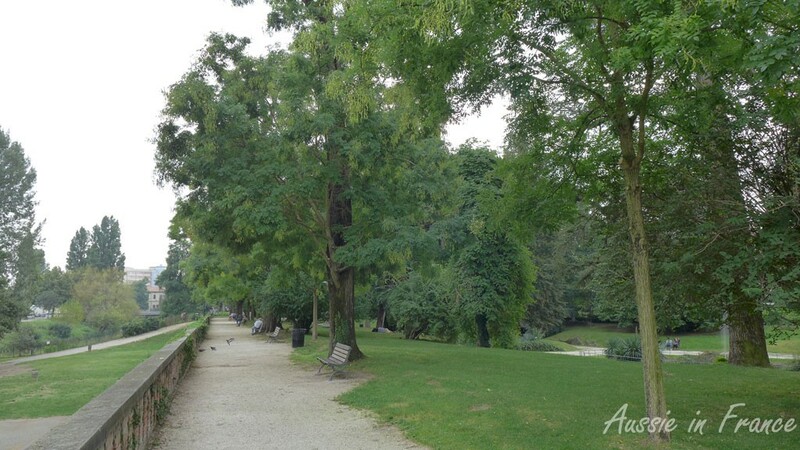 We head off for the Parco dell’Arena to have our picnic lunch (it’s an intermittent fast day) and decide what to do next. Although the old town isn’t that big, having our bikes gives us a much better choice than if we reon foot. 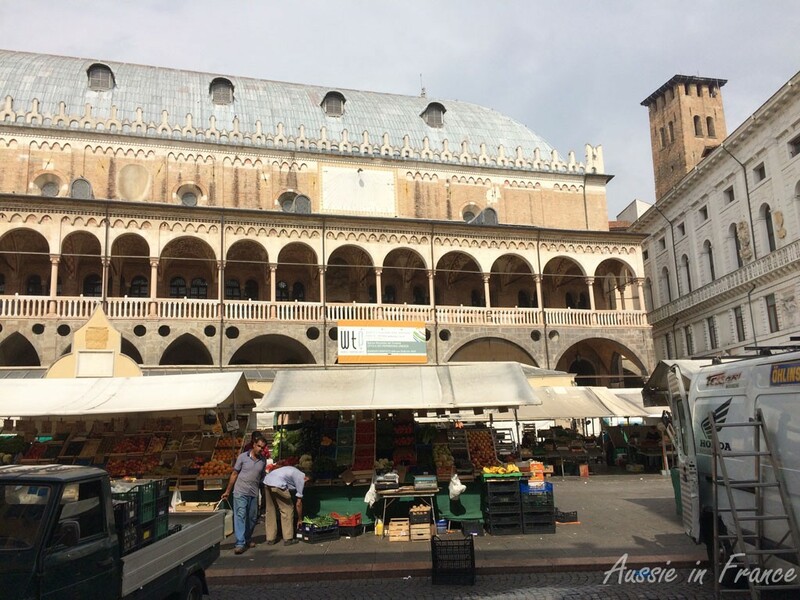 We visit the Piazza della Fruta and the Piazza delle herbe where they are starting to pack up after the daily market, including a visit upstairs. 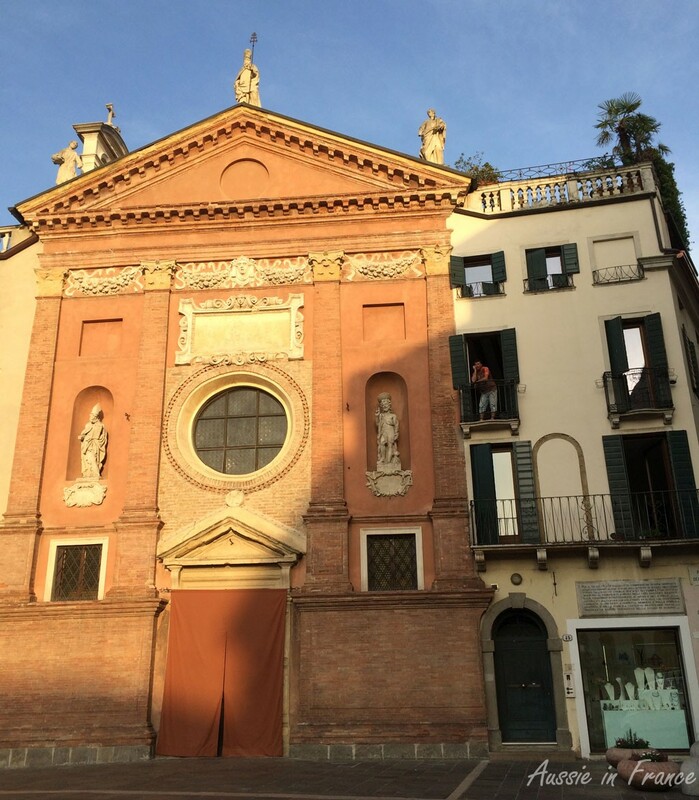 The 13th century Venetian-style building has both a clock and a sundial. 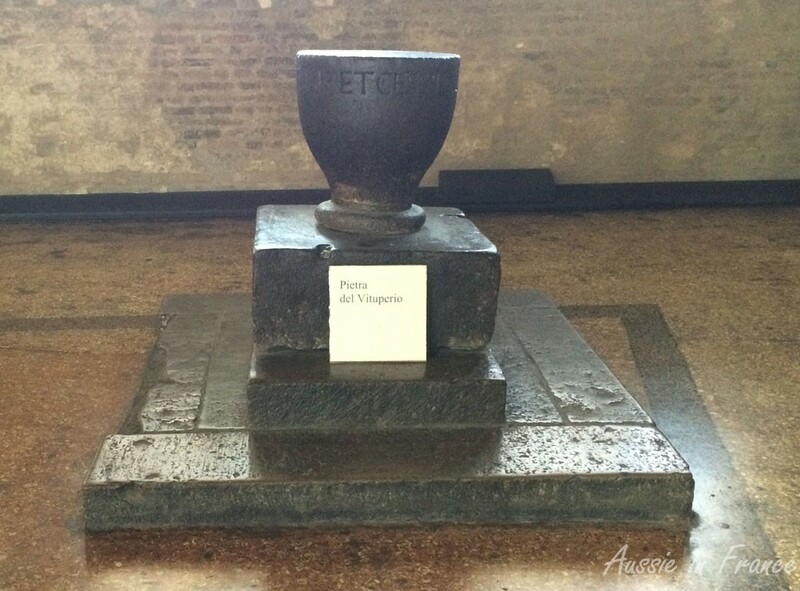 The “stone of shame” inside the Palazzo della Ragione on which insolvent debtors were exhibited in their underwear! 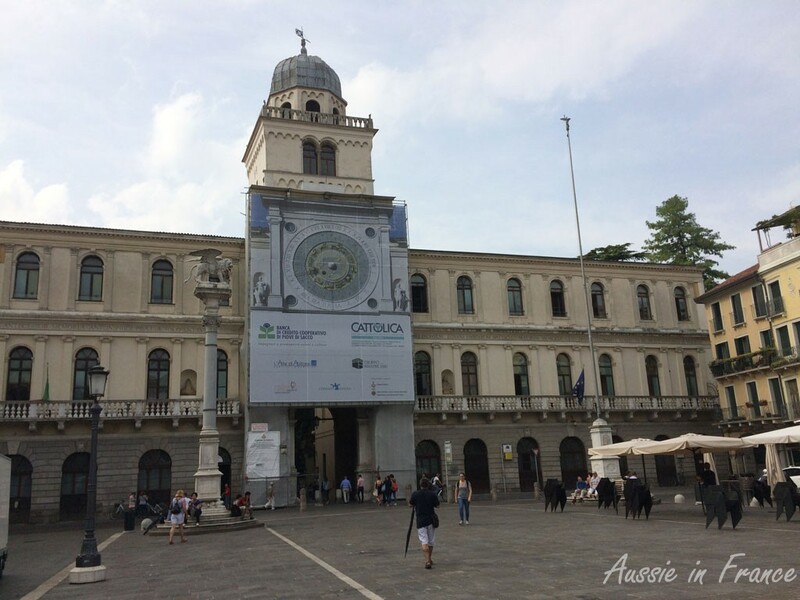 But the oldest clock in Italy is in the nearby Piazza dei Signori, unfortunately being restored. At the Piazza del Duomo, we visit the Baptistry next to the cathedral with its lovely frescoes. Entrance is covered by our Padova Pass. We’ve had enough visiting for one day so head back to the car. I have to press the SOS button on the ticket machine and give the car registration number and Padova Pass number so we can get out the car park. 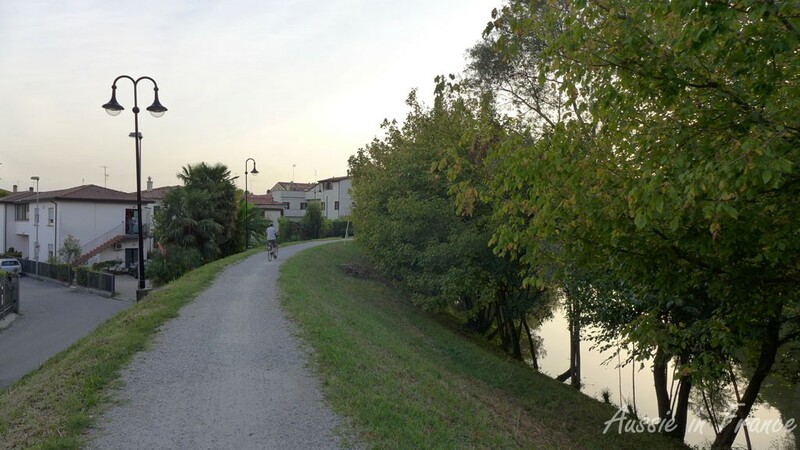 The B&B is in a residential area called Noventa Padovana and has a large garden. As soon as we’ve taken our things up to the room, we take our bikes off the tailer and, following our hostess’ instructions, cycle down to the canal. So far, so good. It seems we can take the path on either side. 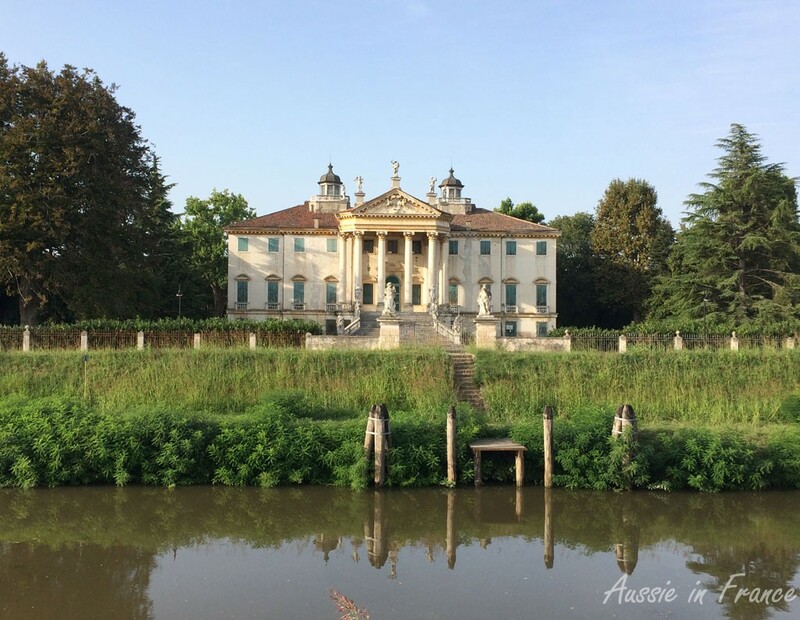 Not far along we see the most amazing building which turns out to be Villa Giovanelli, a Paladian villa built in the 17th century. After that, the road narrows to a couple of deep ruts and we’re no longer sure if we chose the right bank. We eventually come out on a road and don’t know whether to turn left or right. I ask another cyclist for the centro historico and he sends me to the right. We go over a bridge and see the Brenta on our left. By now it’s about 5.30 pm and people are obviously coming home from work. We follow the path along the river hoping we’re going the right way. I ask for directions again and am told to go left over the bridge and straight on. Jean Michel is his usual doubting-Thomas self but we eventually reach an intersection that he recognises. He then takes me back to Piazza dei Signori for a cold drink. The ride home is less eventful and takes a little over a half an hour. Wonderful ! We won’t have to take the car tomorrow to visit Padova. 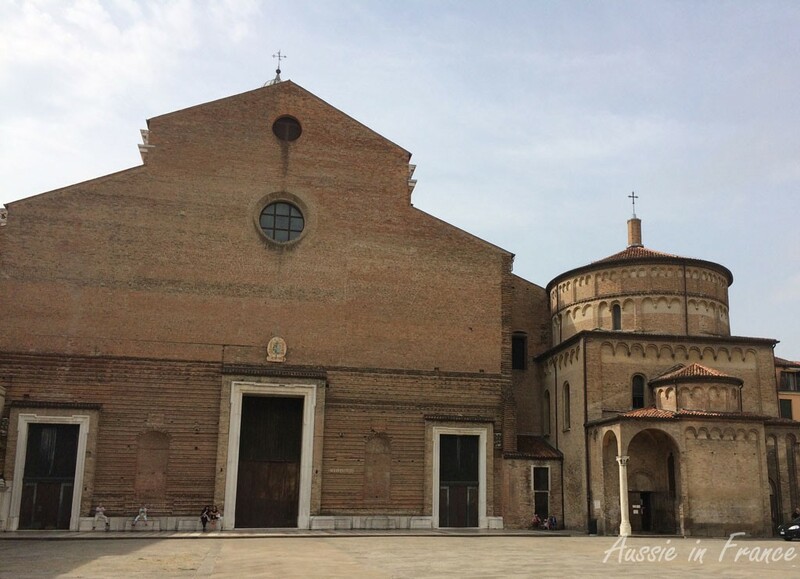 This entry was posted in Architecture, Cycling, Italy, Sightseeing, Travelling and tagged cycling in Italy, cycling in padua, padova pass, padua. Bookmark the permalink. I can’t help admiring you and Jean Michel for biking your way through Europe. It seems like an excellent way to see a lot of places. It’s great that you have bike paths in so many places. I’d be very afraid of cars on public roads. Padua looks great, I envy you for this trip. 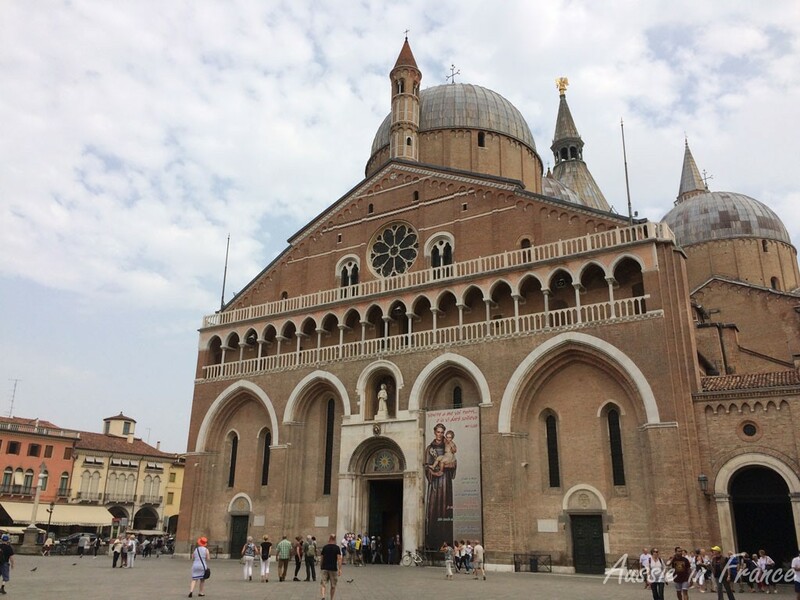 Excellent write up on Padua – would love to visit! 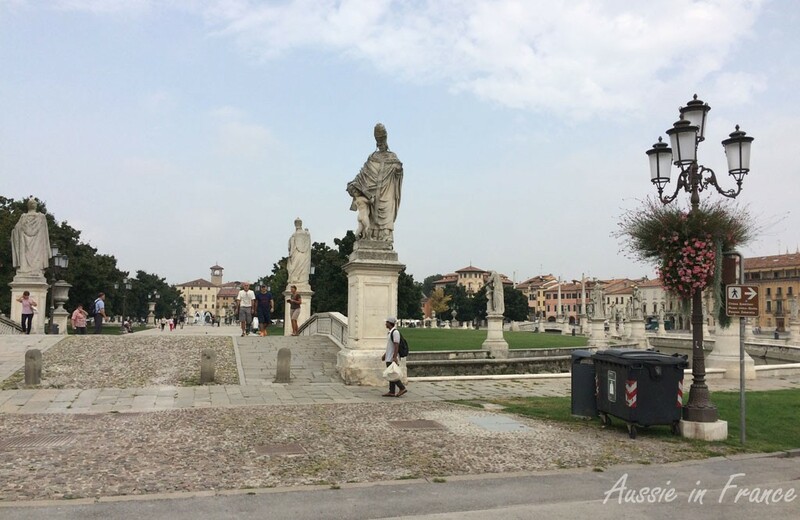 Padua is an awesome city in Italy. You have shared an interesting info. I going to visit Europe next year and try to visit Padua too! John Reese recently posted…How to Maintenance Mountain Bike – Tips and Technique from Expert!